« Sydney Felt Like Armageddon? 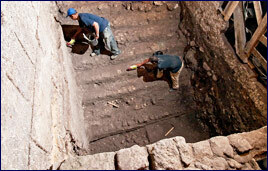 2,000-year-old mikveh (ritual bath) has been uncovered just 20 meters from the Western Wall. Given its location just outside the Holy Temple – where untold numbers of Jews regularly immersed before entering – the newly-revealed pool is among the largest ever discovered in Jerusalem. Josephus, the famous…historian of the period, wrote that the administrative and governmental center of Jerusalem was located at the foot of the Temple, and that among the buildings there were the National Council and the Lishkat HaGazit, Chamber of Hewn Stone, where the Sanhedrin – Israel’s Supreme Court – convened. The archaeologists feel that it is possible that the luxurious hall aside the mikveh was originally one of these structures. Archaeologist Alexander Ohn, the director of the dig, explains: “It is interesting to note that in the middle of the first century, changes were made in the grand structure. It was no longer used for public administrative purposes, and in its western wall a large mikveh was installed – with 11 steps descending into the immersion pool. It is interesting that this mikveh was used for the Holy Days. A lot has been reported about the discoveries in the Temple area this year (several are in the “Old Testament History” category for this page; some are in other categories). Perhaps it should be mentioned that the Fall Holy Days, such as the Day of Atonement and Sukkot (the Feast of Tabernacles in English) are rapidly approaching. This entry was posted on Wednesday, September 23rd, 2009 at 12:32 pm	and is filed under COG News, Religious News.